Facing its first true Mid-American Conference challenge of the year, Ohio needed everything to go its way to remain undefeated this year in the MAC. 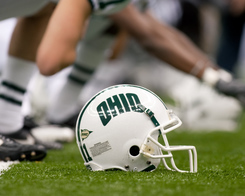 Ohio University Bobcats face their biggest challenge yet while on the field. and couldn’t stop much of anything, and the result was a 49-14 loss to Western Michigan at Peden Stadium. “We just seemed to be off our game in so many different areas,” Ohio coach Frank Solich says. For a defense that has looked strong all season, this game didn’t leave much hope. Linebacker Quentin Poling, who was named MAC East Defensive Player of the Week for the second straight week, went down with an injury early in the first half and didn’t return. In the second quarter, senior cornerback Ian Wells was removed after a helmet-to-helmet hit on Western Michigan’s quarterback Zach Terrell. Two plays after the removal, Terrell found wide receiver Daniel Braverman for the first score of the game, and from there, it was all downhill for Ohio’s defense. With Poling out and both Jovon Johnson and Blair Brown battling injuries, Ohio surrendered 430 yards on the ground. However, most of those yards came from long runs. On game day Western Michigan had six runs of 38-plus yards. To make matters worse, all five of those runs rarely saw a defender lay a hand on the Broncos’ running backs. All five of those long runs were identical; running back gets the handoff, finds a wide-open hole in the middle of the Ohio defense and either takes it to the end zone or is chased down by a Bobcat defender down the field. But as bad as the Bobcats’ defense was, their offense put this game out of reach in favor of Western Michigan as early as the third quarter. Outside of a late first half touchdown drive, the Bobcats offense was a nonexistent threat from the first possession of the game. The run game, which has had its ups and downs through the first six games of the year, was unable to move the ball with any sort of success. With the lack of a ground game, the Bobcats in turn struggled to move the ball through the air to any more success. Ohio quarterback Derrius Vick struggled to hit open receivers, overthrowing a number of his passes. When Vick was able to find open receivers, it was only a short pass in which the receivers were stopped, which was right after the ball was caught. The Bobcats had plenty of these opportunities in the first half, but dropped passes and got stuffed at the line of scrimmage, which limited Ohio’s chances of not just scoring, but moving the ball in general. It took Ohio almost 21 minutes to take a snap inside of Bronco’s territory. During that play, running back A.J. Oullette was tackled in the backfield on 4th and 1 at the Western Michigan 49-yard line.